We've always felt somewhere between the 4th and the 5th, both figuratively (they seem to be the two arrondissements that most call to us) and literally (in the middle of the Seine). So when I went on the house-hunt, I was torn. In most ways, we expected to move to the 4th, the Right Bank, the Marais. It's where the girls go to school, where Anthony gets on the metro for work, where we take painting classes and dance classes. But there's a problem: most of the buildings are old, and even a 900 square foot, 2 bedroom apartment is a rarity. When we do find one, the location is great, but often the rooms are ancient, narrow, and tiny. They all beg the very important family question: where will Pippa lay down her practice balance beam? Here are some of the Marais gems we look at, but don't take. This one looks pretty, and the view is nice, but the living area is small. And let's not even talk about closet space. In this apartment, this is all the built-in closet space for the entire family. Since we've been renting a furnished apartment, we're just not up to buying a ton of armoires (even IKEA armoires) for our remaining time here. This apartment below ticked off most of the requirements: convenient to all family activities, large enough, lots of character, one of the most beautiful front doors I've ever seen, and it was just vacated by a French star, who shall remain nameless (even to me: the agent is too discreet). It's a 5th floor walk up, which actually means the 6th floor, but we could survive that, if it weren't for the fact that it's unfurnished. And we're just not ready for that level of hassle. In some cases, unfurnished does not just mean no furniture, it also means no appliances and, sometimes, no cabinets even in the kitchen. It's just a huge waste; you see people moving out, throwing away their cabinets, so that somebody else can move in and put in cabinets. The appliances are no better: You have to take out the appliances that fit in the space and move them to another place where they might not, in which case you sell or trash them and buy new ones to fit. Meanwhile, the person moving into your apartment is doing the same. It drives me absolutely crazy, and I consider it to be one of the truly stupidest aspects of life in France. While we were house-hunting, we even checked on the other side of the 4th, in the 11th, right past the Bastille. Anthony liked this apartment below, and I must admit the space inside was fine. But the entrance, past a couple smelly garbage cans and then up this dank stairway turned me off so badly, I was ready to say no even before I'd gotten through the front door. My favorite apartment that I saw was a little further into the 11th. It was huge, with 4 bedrooms (!) lots of common space, and the prettiest entryway! It had old-style colombage plaster and wooden beams, stone walls, and loads of character. The price was even right. It was great in every way, except it was just too far. It was a long walk to school, a long walk to the metro, a super long walk/commute to most activities, and not the most charming neighborhood outside the staggeringly lovely, long courtyard. But probably the main factor driving us to live in the 5th is Pippa and her commute to and from gymnastics. It seems like such a silly reason to give up the Marais, giving Anthony a longer commute to work and the girls a longer commute to school. But Pippa has two teammates living near here in the 5th, and the Left Bank in general is so much more convenient to her gym than the Marais would be. This matters, because she is at the gym 4 evenings per week. If she can't get to and from gym conveniently either by herself or by carpool, that means that I have to be at the gym 4 evenings per week, too, waiting for a total of 13 hours while she does her thing. And so, largely for Pippa's convenience, and my sanity, we're in the 5th (thank you, Anthony!). In the 5th, we first look at the apartment below, formerly belonging to a movie producer (he's done movies you've heard of, but this time I'm the one being discreet). But it's not available till mid-December, and our Ile Saint Louis landlords want their place back in October. The furniture's a bit modern for my taste, but when you're renting temporarily, and furnished, in Paris, you just can't be that picky. That's OK, because we are also offered this 110 sq m (around 1100 sq ft) place in the 5th, through friends, which means we don't have an agency fee. That's nice. One of the things we actually appreciate about changing apartments -- besides the forced purging (Anthony's in heaven) -- is that this one is not over-furnished like the last place, where every square inch of floor space was covered. Here, we even have to bring in a few things (desk, extra chair, carpet, TV stand, TV...). We get to hang our own art on the walls, and because it's a less cluttered place in a quieter neighborhood, it definitely feels calmer. We've already hosted an almost-Thanksgiving dinner and have our Christmas tree up. It turns out, we live in a sort of Golden Triangle of Wonderful: it's one of the truly rare parts of Paris that is both authentically old yet not overly touristy. 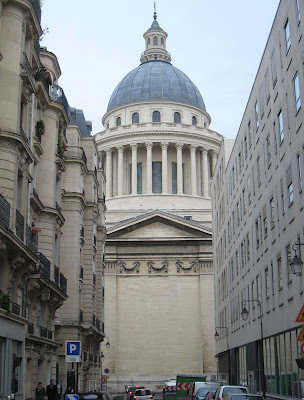 Besides the Great Mosque, which I've mentioned, we're also right next to the Jardin des Plantes (one of Paris' big, beautiful parks), Place Monge (home to a wonderful 3x-per-week market -- one of my favorites in the city), the Pantheon (with all the twisty alleys leading up to it, including the main setting for the movie Midnight in Paris), and rue Mouffetard. Aah, rue Mouffetard -- Mouffetard Street. For those of you who know San Francisco, you'll understand when I say that I love Mouffetard because it reminds me of a French Clement Street. It's just the right combination of cheap and authentic shops for locals, yummy places to eat at all ends of the price range, and gentrified shops. We have found at the bottom of Mouffetard (the best half, by far), the most delicious Mexican food so far in Paris, authentic Belgian Liège waffles, a great hardware store to buy plastic bins, a big natural food store, and a fancy restaurant with the most generous cheese cart I have ever seen in my life (and you know I've seen a few). I know you're curious about the price of housing in Paris. The places we looked at were generally in the 2,800 - 4,500€ per month range. If we were willing to go higher, we could have found a few more options, though not as many you'd expect. It's not just that big Marais apartments are hard to pay for; they're also hard to find. Yes, we know rents are unpleasantly high (unless you live in San Francisco, London, Hong Kong, or Tokyo: then you understand). But we couldn't go any lower if we wanted a 2 bedroom in these arrondissements. that's at least 85 sq m/ 850 sq ft. By Parisian standards, we are space hogs. Some of the apartments had huge agency fees, others had small or none. Some included some or all utilities, others had significant hidden HOA/condo fees, especially the less expensive ones. Some were furnished, and others were stripped bare. We pay near the lower end of the range, which seems like a pretty good deal by Paris standards, though the apartment actually needed a lot of work when we moved in, including putting in light fixtures (there were dangling wires with light bulbs hanging out of the wall) and overseeing some cosmetic renovation work. So we figure the pricing reflects that we're helping out the landlords by cleaning it up for future renters. And just in case you're wondering what the worst part of the move was, it was not leaving our home of four years, though this was very emotional and difficult. It was not packing or unpacking, though this was a pain. It was not even finding the new apartment. The hands-down winner was.....getting internet installed. In the middle of Paris, well into the 21st century, it took us 3 months (yes, three) to get our internet working -- not to mention all the phone calls, hysterical, crying phone calls in which I pleaded futilely and tried out my best French cursing to absolutely no effect (but cathartic, I tell you, cathartic). The land-line that's supposed to go with it still doesn't work (nearly 4 months after ordering it). Evidently, the feast is moveable, but telecom service is not. 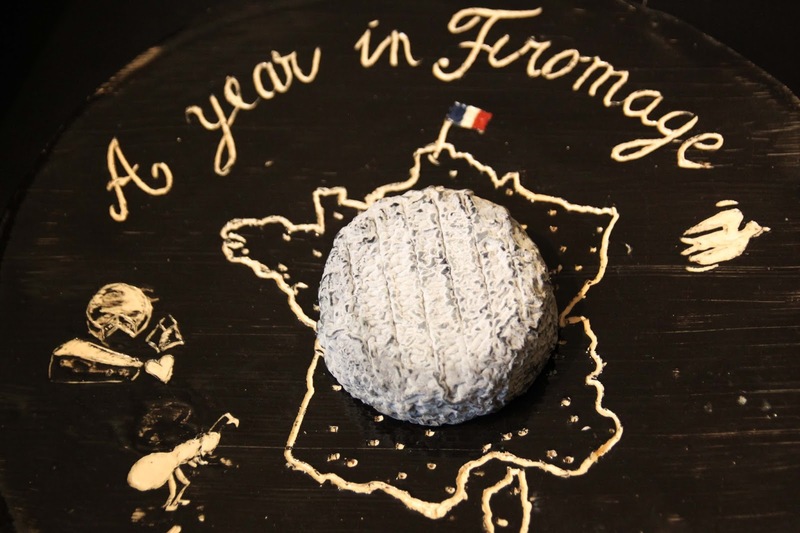 Fine Fleur de Celles is a chèvre from Deux-Sèvres, specifically a hand-ladeled, lightly-ashed goat cheese made from raw goats' milk in Celles-sur-Belle (have you ever heard of a better town name?!). It's made by the dairy cooperative called Sèvre & Belle. Yes, Sèvres is plural in the place name, but singular in the dairy name. I've had to triple check. Why, French language? Why do you do this to me? The cheese is delightful, a real winner for all ages. It's creamy and thick, with a gentle goat flavor -- just enough to let you know you're eating a real cheese, not some fake processed thing, but not so much that you feel like you're licking a goat that just wandered in from the rain. I buy this Fine Fleur de Celles at one of my many new local cheese shops, at the base of the rue Mouffetard. There must be half a dozen particularly lovely cheese shops within a five minute radius of our new apartment, and I'm not complaining. It's one of the nice things about moving off Ile St. Louis (a.k.a. DisneyParis), where there are just not that many shops for locals. New fromageries means new cheeses for me, since each one tends to have their favorite suppliers and standard offerings. Now, I just have to learn what the closed-days are for each one, almost certainly through trial and error.